This book has two aims: to entertain the reader by first-hand African folklore and to stimulate the researcher by its detailed study. The 64 tales have not been published before, the author recorded them in Namibia between 1960 and 1997. They range from myths to animal tales, from magic and ogre tales to legends and personal experience stories. Part II gives background information on the narrators and the distribution of these stories in Southern Africa. Part III summarizes and updates the theoretical discussions which the author provided in the seven volumes published in German (1991–1999). They are the fruit of 40 years of attachment to Namibian folklore and the insights gained by listening to hundreds of different story-tellers. The study focusses on the traditions of the Nama-speaking peoples but they are always seen in relation to further African lore. 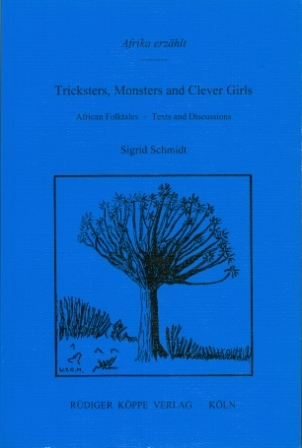 Special emphasis is laid on the stories about the mythical trickster because they are a unique treasure of the Khoisan peoples. But the essay also debates basic questions of the remaining genres: What are the characteristics of African magic tales in relation to Western magic tales? Why do African storytellers enjoy animal trickster tales inspite of the hero's questionable moral standards? Why do storytellers and audience laugh when gloomy ogre tales are told? Are there stylistic particularities and motif-like expressions in personal experience stories?